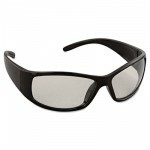 Lightweight, “retro-style” safety glasses make a fashion statement while providing protection. Wide temples improve stability and structural integrity. Lenses are cut to provide clear, distortion-free vision. Dual lenses with 8-base curve and wraparound coverage. High-performance polycarbonate lenses give 99.9% UV protection. Eyewear meets ANSI Z87.1+ impact standard.